There are so many ways to go green in real estate now that technology is focusing on this issue. You aren’t forced to shop in the back of the large box stores to find some obscure item that works on solar power and cuts your energy in half. Rather, these items are being featured in displays and highlighted in ads long before the consumer walks through the front door. Because of this, it’s become much easier to not only make your house more eco-friendly but also save some serious cash at the same time! One way to do this quickly and easily is to measure how much wattage you’re using during your everyday activities. If you install an energy usage monitor, you can find out what time of the day you spend the most money on energy and what you’re doing at the time. Depending on what kind of plan you’re on with the utility company, you may be able to change your activities and save money during the day. For example, if there are certain hours you pay higher rates, you should probably avoid doing laundry at that time. The proper lighting is always necessary to avoid eye strain and make sure everyone is safe. When you’re considering doing renovations to make lighting safer and cheaper, look at all your options. In this field especially, you can incorporate timers, dimmers and anything else that will help you reduce your consumption. By learning to use the lighting wisely and incorporate natural light as well, you may be able to cut your lighting bill in half. This will translate into savings for any future homebuyers as well if you decide to sell the property later on and you’ll have the energy bills to prove it. Rather than rely solely on your heating and air conditioning, install a whole house fan. These are fantastic for circulating air and saving you a ton on money on what is typically the largest part of your utility bill. While saving you cash, it again increases the asking price for the home later on. Many times, these features are very attractive to prospective homebuyers because they don’t have to pay for the additional upgrade. Water heaters have come a long way over recent years as well and it’s no longer necessary to pay for the water to heat all day long. Rather, you can choose from both tankless and instant water heating systems that help you far less to the utility company. Check out your options if you’re buying an older home to see what additional renovations need to be made in order to accommodate this system. 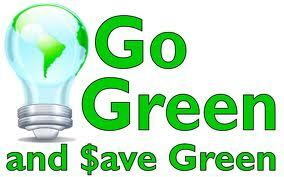 By using all of these tips, you’ll find that going green can definitely bring you more green. The more money you have in your pocket, the more you’ll have to spend on renovations and changes you like all throughout your new home.